Mumbai : A picture of small town kids trying to click a selfie from a slipper has gone viral on the internet, while many people are going 'awww' over the innocence captured in the photograph, Amitabh Bachchan feels like it is a photoshopped image. "You're only as happy as you choose to be," writes Boman Irani while sharing the picture on his official Instagram page. 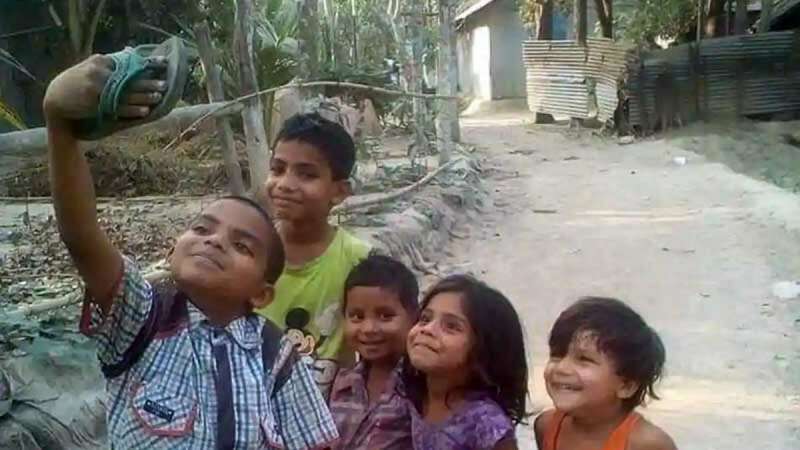 Five children smile heartily as one of them clicks a 'selfie' in the photo. A closer look reveals the selfie-taker is actually holding a slipper. "Things turn out best for the people who make the best of the way things turn out," wrote Anupam Kher as he shared the image. "HAPPINESS truly a state of mind," said Suniel Shetty. While everyone gave a thumbs up to the image, Bollywood megastar Amitabh Bachchan said he feels like the image has been photoshopped. ".. with due respect and apology .. i feel this is photoshopped .. notice that the hand that holds the chappal is different than the rest of his body in size .. to his other hand by his side !!" he tweeted in response to Atul Kasbekar's post. Now, the internet people are sharing their opinions on whether the assessment made by Big B are correct or not. I think it's not photoshopped. The hand is not as big as it seems to be, if you look closely. This is a distortion because of shooting from the short distance..
Do share your views on the image with us.